Horns, buses, crowds and cars-if the city’s chaos is overwhelming and you need to escape the clamor, head out to the Franklin D. Roosevelt Four Freedoms Park for a little tranquility and history. The four-acre memorial to Franklin D. Roosevelt is located at the southernmost tip of Roosevelt Island, in the East River between Manhattan Island and Queens. Designed by re-known architect Louis Kahn in the 70’s, the memorial was created to celebrate the Four Freedoms articulated in FDR’s 1941 State of the Union address. A combination of Kahn’s death and the city’s near bankruptcy delayed the memorial project for over 30 years. The park was finally opened with a dedication ceremony on October 17, 2012 but it is still little known to tourists and New Yorker’s alike. The focal point of the monument is a bronze head of FDR, created by the American portrait sculptor, Jo Davidson. FDR modeled for the sculpture in 1933 at the age of 51 during his first term as President. The two mile-long island has a history of human despair. Once called Blackwell Island after its owner, Robert Blackwell, the island has been home to prisons, almshouses, hospitals, asylums and schools. The island is now mostly residential apartment buildings but there are still haunting reminders of its past. 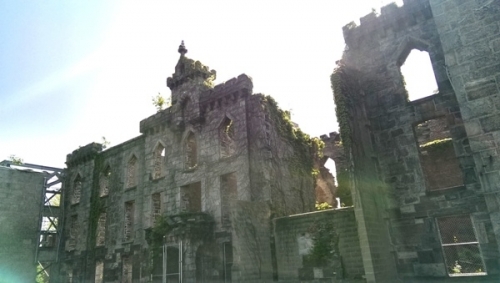 Architectural ruins of the small-pox hospital remain as well as the main entrance to the New York City Lunatic Asylum. This restored octagon-shaped structure now serves as an entryway to two private residential buildings. A light house, built by convict laborers in 1872, still stands in the aptly named Lighthouse Park. In 1971, the island was re-named Roosevelt Island after the former president and in 1973, the planners announced their intention to build a memorial to Roosevelt at the island’s southern tip. All photos were taken with the new HTC One smartphone, provided by HTC – its wide f/2.0 aperture and optical image stabilization (OIS) really help with low light situations or like here with a bright background where I used the backlight mode. My photos came out great, although it is really hard to take a bad photo here. 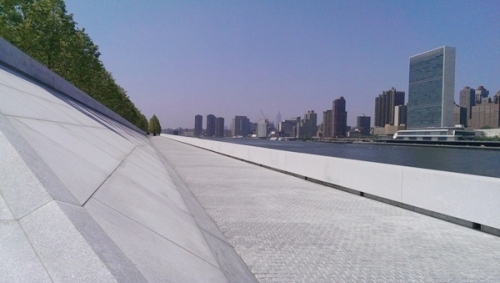 Four Freedoms Park is open 6 days a week, 9 am to 7 pm and closed on Tuesdays. By Tramway Car: at 59th Street & 2nd Avenue Station. Exit at Tramway Station on Roosevelt Island. Walk approximately 15 minutes south to Park. Alternately, walk north to Main Street and catch the Red Bus south. Cost is 25¢. Tram and Red Bus are wheelchair accessible. Subway: Take Queens-bound F train to Roosevelt Island stop. Walk approximately 15 minutes south to Park. Alternately, walk one block east to Main Street and catch the Red Bus south. Cost is 25¢.